Being a huge lover of wholesome food, I was beyond excited when I chanced upon Idealite. They are a well-established chain from Malaysia since 2011 and have been very popular among the locals, especially on the 1st and 15th day of the lunar calendar when most Chinese would eat Vegetarian meals for the entire day. 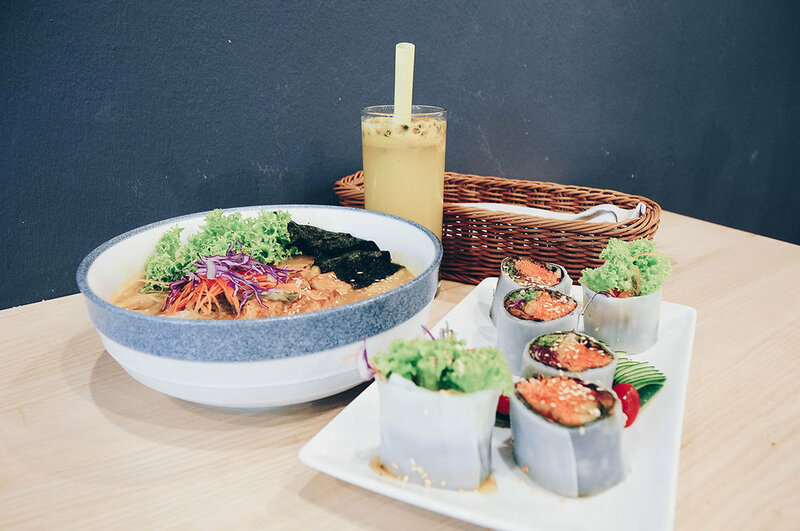 They have since opened their first outlet in Singapore located at Bugis Village, close to Bugis street. I love how cosy the place is, with warm lightings and nicely decorated walls. One of them even has their mission painted on it - their 8 Balanced Nutrients Tasty Shu-Food. I was also told that in Penang (where their first outlet is), they hold health talks every month including school tours and promoting the selling of healthy food in school canteens. While I was there I remember flipping through their menu which had an endless amount of choices! It was hard for me to choose but I ended up going for their Hokkaido Vege Sushi, Miso Ramen Soup and a Pineapple + Passionfruit juice. All dishes tasted so pure and nourishing, neither was it salty nor oily! Those who are health-conscious, or eat an oil-free diet would love the dishes here. Moreover, they are all reasonably priced. Next up is their Hokkaido Vege Sushi roll. These were handmade with a plethora of Vegetables - Purple cabbage, carrot and Yam Bean. Super fresh! :) If you are a small eater, this could definitely be a substitute for your lunch. This dish was my favourite among all! The Hokkaido Miso Ramen - Do note that it comes with a soft boiled egg so if you are Vegan, do instruct them to remove it for you. The essence of miso soup stewed with fresh pumpkin puree gave it the unique taste compared to other regular Miso Ramen soup. It was not super thick but creamy enough to make it a good broth. It came with Shimeji Mushroom, seaweed and tofu. Other items on the menu that caught my eye were their Porridge that's made with Millet and Green Curry cooked with Oat Milk; Definitely, on my 'to-try' list the next time I head down to Idealite. Overall, It was truly an incredible dining experience at Idealite and I would highly recommend it to those who enjoy a wholesome meal because this place is definitely for you! Additionally, they recently celebrated their grand opening on 17th December in Singapore. Idealite serves mainly Vegan food, but some of their dishes contain eggs. But definitely no usage of Milk and other animal products.